Best Value at Caribe - Now 2 King Beds ! Relax in Our Beautiful Tropical Decor! PLEASE NOTE!! There is a one time $20 parking pass pr/ car not included in the Instant Quote because you have to buy it/them at the building. Caribe is a bay front property across the street from the beach. The pictures of the beach are across the street. 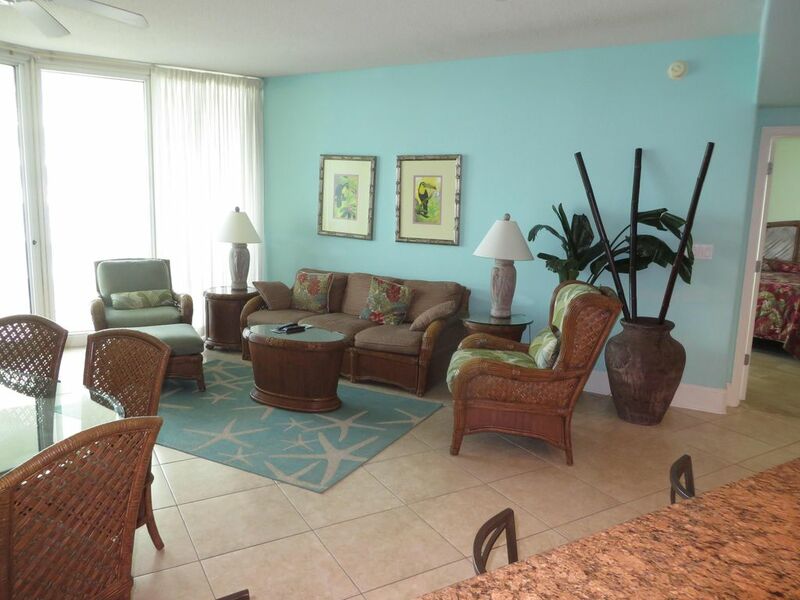 Welcome to Caribe Resort unit 508B. Located a 28103 Perdido Beach Blvd., Orange Beach, AL 36561. - Free access to Health Club with owner keys! Now 2 new King Beds! We have just added a new King Bed in the second bedroom and upgraded the master bed room with a new king mattress. Our Lazy River has been a huge favorite with kids and adults. The on site Deli and game room is now open!! Congratulations!! You have just found one of the largest 2br/2ba condos with the largest outdoor adult and children's pool in the Orange Beach and Gulf Shores area. Caribe is a spacious new Caribbean style resort located in Orange Beach on the tip of an island with lush natural landscaping and water features. The Caribe units were designed as permanent residence with the space and amenities you would expect in a luxury home. Once you stay in one you will never want to stay anywhere else. Loaded with luxurious amenities including granite countertops in kitchen and baths, European style cabinetry, designer stainless steel appliances, 9 foot ceilings, 1400 square foot living space, 24 inch ceramic tile and carpet, professionally decorated, large Jacuzzi style jetted bath large enough to accommodate two, separate shower stall, walk in closet, bar with built in ice maker, floor to ceiling windows in living area and master bedroom, and much more. New for 2010. Professional putting green and Lazy River. This exclusive oasis includes a 8000 sq/ft Olympic-size swimming pool, the largest in the area, with a mini water-park-caliber water-slide, children's playground, walk in dry sauna and steam room, state-of-the-art Professional fitness center, 3 tennis courts, bar-b-que area, on-site snack bar, 3 outdoor hot tubs, 1 indoor hot tub, poolside snack bar, and more. Complimentary trolley service is available to close by Perdido Pass, the most beautiful & natural beach in the area!! Living area is equipped with 42' Flatpanel High Def. TV, Blu-ray DVD and Surround Sound speaker system. Every room is equipped with Direct Satellite TV and Premium HBO Movie channels. Bedrooms both have High Def TVs and DVD's. FREE T1 High Speed Internet access is included in our condo and wireless internet access is available in the condo, lobby, atrium and pool area. FREE health club membership. Assigned covered Parking for one car. Send us an email for additional information and pictures. Large lazy river, professional putting green, direct view of Bay with constant boat traffic and frequent dolphin sighting. Jacuzzi tub in large master bathroom and Bay front master bedroom. 2 full bathrooms. Bathroom in master suite has a Jacuzzi Jetted Tub. and full shower. Located in Caribe Resort on the tip of Perdido Key in Orange Beach AL. Direct bay view from inside. Ocean & Bay view from balcony. Surrounded by water on the tip of Perdido Key! 24 hour gated security, State-of-the-Art Fittness center, Sauna & Steam Room, Lazy River. Orange Beach/Persido Key nice as always. Another get week of weather. Caribe was nice and week kept as it always is. We Loved the view from the balcony!!! Kitchen was spacious and full equipped!!! Condo was very nice and we enjoyed our stay!!! We have had a wonderful time in this beautiful condo. Everything in it is perfect. The views of the Gulf and Bay from the large balcony are wonderful. We are planning to rent it again next year. We had the pleasure of meeting Rick & Bev, the owners, and we congratulate them for having this unit so nice, so clean, and very well mantained and decorated. The resort was everything we wanted and more. The condo was absolutely beautiful! The Caribe was an amazing resort with gorgeous views. The condo was absolute perfection! The kitchen was fully equipped with lots of little extras. The beds slept wonderfully and the master bath was a dream. The view from almost every room was spectacular! I hope that we can go back next year! It was the perfect vacation! Condo was very clean and comfortable. AC worked great, all supplies you need in the kitchen. Living room furniture could use some updated but was still ok.
We had a wonderful time. The condo is perfect and the beds and pillows are so comfortable. The balcony was awesome you can see the bay and the gulf! Professional putting green!, Lazy River, Lighted Tennis on grounds!.